Crystal Cruises is an American cruise line with headquarters in Los Angeles in the United States. In March 2015, former parent company Nippon Yusen Kaisha (NYK) announced that it was selling Crystal Cruises to Genting Hong Kong (GHK). Since the acquisition, Crystal Cruises has become Crystal, Ltd. The company was founded in 1988 and commenced operations with Crystal Harmony, which was retired from the Crystal fleet in 2005. On March 3, 2015, NYK announced that it was selling Crystal Cruises to GHK, the owner of Star Cruises and a major shareholder in Norwegian Cruise Line Holdings. The sale price was US$550 million in cash, subject to certain adjustment items. Simultaneously, NYK announced that Crystal Cruises would be building a new ship, but did not provide any specifics, such as the new ship's size, or date of entry into service. On May 15, 2015, GHK announced that it had closed on the acquisition. Crystal Yacht Expedition Cruises launched in December 2015 with the Crystal Esprit. The 62-guest, a 3,000-ton yacht is outfitted with features including a two-passenger submarine, four 10-passenger zodiacs for excursions and a 12-passenger yacht tender for boating adventures. Additionally, water skis, wakeboards, kayaks, jet skis, fishing, scuba, and snorkel equipment are available. On January 15, 2018, the company cut steel for Crystal Endeavor at MV Werften. Crystal will debut its new PC6-designated expedition yacht in 2020. Crystal Endeavor will have a tonnage of 19,800 GT and will operate polar expeditions as well as voyages in remote tropical regions. The yacht will offer accommodation for 200 guests. In July 2016, Crystal launched Crystal River Cruises with the re-furbished vessel Crystal Mozart. Crystal Bach and Crystal Mahler, the first two of four "Rhine Class' new-build river ships, were added in 2017 followed by Crystal Debussy and Crystal Ravel, in 2018. Crystal Mozart is Europe's most spacious river ship, at twice the width of any other. Crystal Luxury Air private jet service launched in 2015 with the company's Bombardier Global Express jet, available for charter and accommodating 12 guests. In August 2017, Crystal AirCruises took flight with the launch of Crystal Skye, a Boeing 777-200LR configured with 88 first class flat-bed seats, a lounge/dining room that seats 24 and a full bar. The National Hockey League is one of its first three charter customers. In addition the company took delivery of a Boeing 787 Dreamliner in May 2017. This aircraft is currently stored. It was announced on February 4, 2016 that Crystal Cruises had signed a purchase option for the SS United States, Crystal would cover docking costs in Philadelphia for nine months while it conducted a feasibility study. The plan was formally dropped on August 5, 2016, citing too many technical challenges. 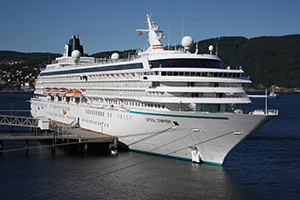 But Crystal Cruises did announce a donation of $350,000 to cover docking costs through to the end of the year. Crystal Cruises originally set sail in partnership with Caesars Palace at Sea casinos on its first ship, Crystal Harmony. 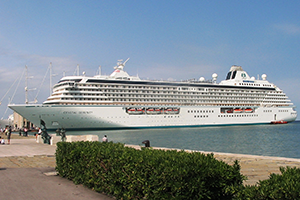 The partnership continued with Crystal's subsequent ocean ships, Crystal Symphony and Crystal Serenity. After the acquisition by GHK, the casinos were re-branded under a new partnership with Resorts World Casinos.